This gift will "capture and preserve" an important time in your life. This will show your true love or appreciation. This classic bottle becomes a permanent reminder of what this day means to the two of you. They will keep it in a special place. It preserves one of the greatest moments in your life. 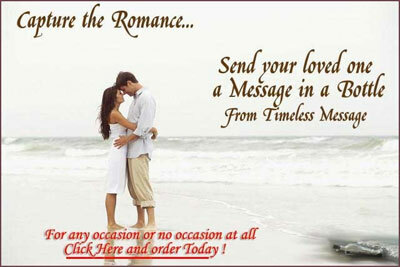 A "timeless message" to your loved one. It's a perfect Anniversry gift. This is also a wonderful engagement keepsake to your future husband or wife. How about a special thank-you to someone who has made a huge difference in your life? It's a simple process: You choose a bottle, you choose or write your message. Your words and feelings written and placed in a unique keepsake bottle. The bottle itself is a work of art. Since the message stays inside the bottle, they receive a separate paper that allows her to know what your message says. This is one gift will be never be forgotten. Your words of appreciation and love expressed in such a unique way can bring lasting happiness. That's what it's all about. You can't go wrong with this very thoughtful gift. There one for every budget with prices starting at $30. You can write your own message.